ng guerrillas flashed across the screen. 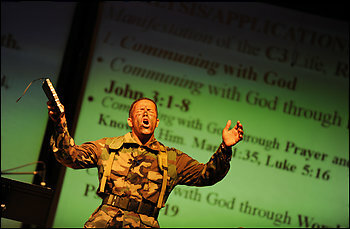 The auditorium filled with the sounds of the jungle as Senior Pastor Rob Seagears clomped onto the stage in camouflage and combat boots, toting a rifle, canteen and machete. If there were an Oscar for sermons, Seagears would be a contender. 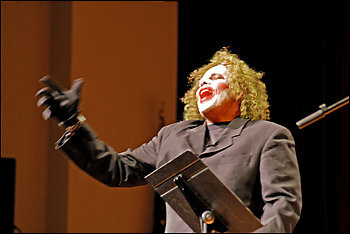 There’s his “Dark Knight” performance, when he roared up to the pulpit astride a Suzuki motorcycle, dressed like Batman. And his whip-cracking Indiana Jones, and his green-suited Hulk. Perhaps most memorable was when he bumbled out wearing a ratty wig and a blood-red smile across his face, ranting like a maniac. Since June, Seagears, senior pastor at Christ Chapel Mountaintop in Prince William County, has based his sermons on the summer’s blockbusters, managing to draw life lessons from the most unlikely subject matter.